NUTRITIONAL CHARACTERISTICS (Compared to Science Plan* Feline Adult) Energy - reduced Fat - reduced Calcium and Phosphorus - reduced, to avoid excessive intake Fibre - increased Produces urine that is less acidic INDICATIONS Science Plan Feline Senior is formulated to meet all the nutritional requirements of healthy cats from 7 years of age, using highly digestible ingredients. OBJECTIVE - To avoid the excessive intake of those nutrients which may have a role in the development of disease conditions typically seen during this life-cycle stage. Science Plan Feline Senior aids in reducing the risk of feline lower urinary tract disease (FLUTD), including oxalate crystalluria and urolithiasis to which older cats are more prone. Science Plan Feline Senior dry formulas also contain a Superior Antioxidant Formula to reduce oxidative cell damage. NOT RECOMMENDER FOR 1. Kittens. 2. Pregnant and lactating queens. During pregnancy or lactation queens should be switched to Science Plan* Kitten. FEEDING GUIDE Many factors such as environmental conditions, activity level, stage of life and individual variation (temperament, stress) can affect the amount of food needed. Adult cats should be fed only sufficient food to maintain their ideal body weight, in one or two meals per day. 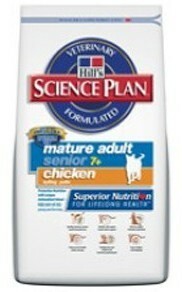 Science Plan Feline Senior should not be supplemented as such additions may upset the nutritional balance. Fresh water should be available at all times. The following feeding ranges are intended as a starting point only and should be adjusted as required to maintain optimal body weight.